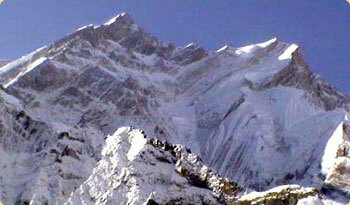 Annapurna IV is considered relatively easier to climb among all the Annapurnas. The normal route to reach the destination is led forward through Manang. It requires two hours walking from the base camp to reach the bottom of the mountain. A 500m fixed rope climbing on approximately 65-70 degrees steep slope should be attempted to reach camp I. To reach camp II, a fixed rope climbing of approximately 1000m is required along the ridge and a little widespread steep climbing. From Camp II to Camp III, it is relatively easier than the others, since this part consists of zigzag crossing and gradual climbing up. However, a fixed rope climbing of approximately 1300-1500m is required. From camp III to the summit, generally fixed rope is not required and the main rope is used. There are possibilities of avalanches between Camp I and II.